Less than 4% of the original Tallgrass Prairie remains in America and most of that is in the Flint Hills of Kansas. The prairie is comprised of native grasses--not planted by any human. Even though it was designed by Nature, it is mankind's responsibility to help maintain the prairie. "If we want it to be here for the next generation, and the next generation, then we gotta do what Mother Nature did before we came here, and we've got to burn it quite often to keep the grassland a grassland." --Mike Holder, Flint Hills Extension District. Mike is one of my heroes--an old cowboy who loves the prairie and isn't afraid to fight for it! 5. To encourage wildlife population -- what's good for the livestock, is good for wildlife! "Fire is critical to prairie chickens and other grassland birds, because it keeps those trees out of the prairie. 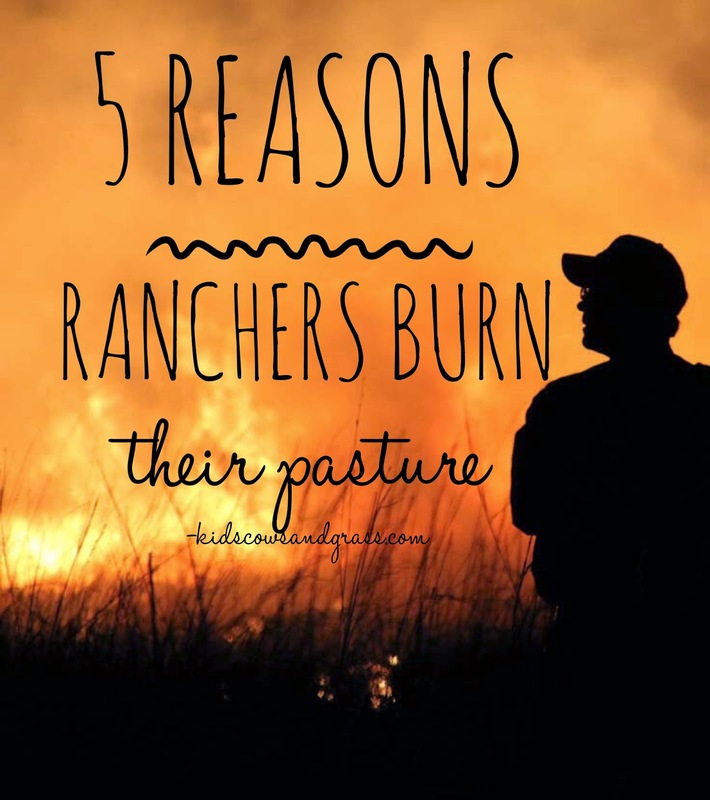 If you do not burn, you end up getting woody encroachment out into those grasslands and what that does is provide habitat ...for predators that prey upon prairie chickens and other grassland birds." Jim Pittman, Ks Dept of Wildlife, Parks and Tourism. 4. Weed control -- Kill woody shrubs and trees. Some people may claim that this is the #1 reason to burn, and frankly, all five reasons are all very closely tied together. Back when the Indians and buffalo roamed free on the Kansas prairie, lightning storms lit fires that raged over thousands of acres in one big bonfire. Once the grass began to regrow, the buffalo came to the fresh, tender grass. The inhabitants also noticed that fire kept killing back the woody weeds and that kept trees from invading the native pristine prairie. So the Indians began lighting the first controlled burns and history was made! 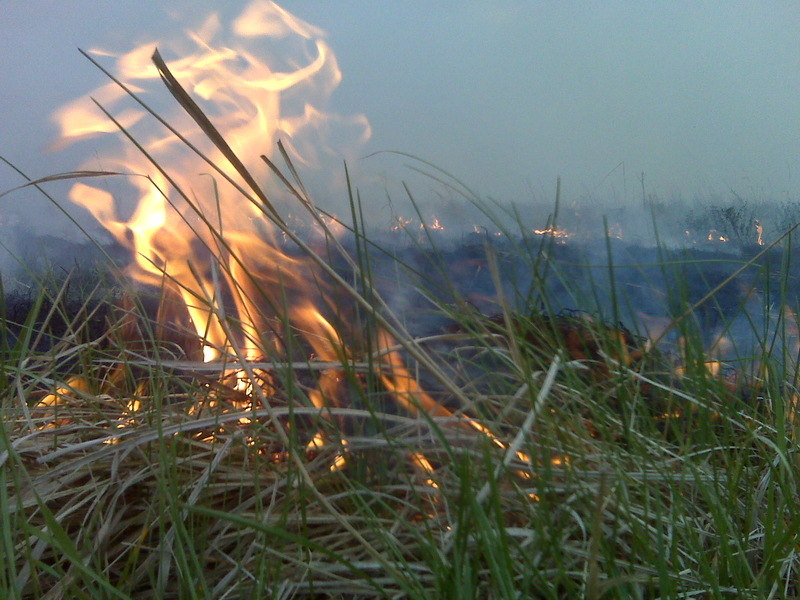 In addition to controlling weeds, burning the grass promotes diversity in the grassland. The beauty of the native prairie is that it isn't comprised of only one plant. Many different grasses and forbs combine to make a healthy, sustainable grassland. "The ranchers in eastern Kansas are really kind of stewards of one of the last pieces of the most important ecosystem in north America," Karl Brooks, EPA Region 7. 3. Promote better utilization of grasses by livestock. Cattle like to eat where it is the easiest to get to the grass, and as they eat, fresh tender grass regrows. There may be luscious, nutritious grass on the next hillside, but often the cattle stay where they are content. So they don't eat down the other hillside and the grass grows tall and lank there. It doesn't taste as good to them, and they ignore it. So we burn off the lank, old grass to encourage fresh, tender and more nutritious grass to grow on that hill as well, luring the cattle there. That is better for the land, not just because there is more to eat, but also it helps control erosion and compaction from cattle walking all over the same land. 2. Better weight gain on livestock with fresh, green, more nutritious grass. The Kansas Flint Hills is mostly Cow Country! Yes, there is plenty of crop ground, too. But for the most part, the hillsides and tops are too rocky to farm. So we manage the grass for cattle to use it. Much of this land isn't fit to grow crops, so we bring nearly a million head of cattle here for a few months in the summer to eat the grass and turn it into something we humans can consume. I can't eat grass--but cattle can convert it to protein. It has been proven that calves grow better on new, fresh grass that doesn't have the old dead grass it must grow through. 1. Use less chemicals. Mother Nature is amazing and constantly changing. One of the biggest reasons we have lost 96% of the native prairie is because it was either good enough land to grow crops, or it has become infested with trees. Cattle don't eat trees and when the eventual infestation of Eastern Redcedar engulfs a part of the prairie, we have lost use of the land as well as the positive impacts of deep-rooted, carbon-sequestering native plants. Without fire to control the woody invasion, we will have to turn to chemicals for widespread control. That not only increases expense, but also labor and safety. Just stumbled across your blog. Glad to be a new follower. Thanks for sharing your life! Thanks for stopping by, Deanna! and I will be checking out your selection of wild rags! !